Edward Parkes and Henry Ayers, the founders of ‘well-mannered coffee’ group The Gentlemen Baristas, have opened a new flagship coffee house in the Republic development at East India Docks. Since launching in 2014, The Gentlemen Baristas’ coffee houses have become a place where people from all over London, from all walks of life, come to meet. They have recaptured the spirit of the coffee houses of old, where manners, service and community are at the heart of the coffee experience. Their latest opening at East India Docks is located in a modern, glass-fronted development and is their largest site to date, with 70 covers (plus 16 outside in warmer weather), bringing together a modern aesthetic with an old fashioned spirit and well-mannered approach. 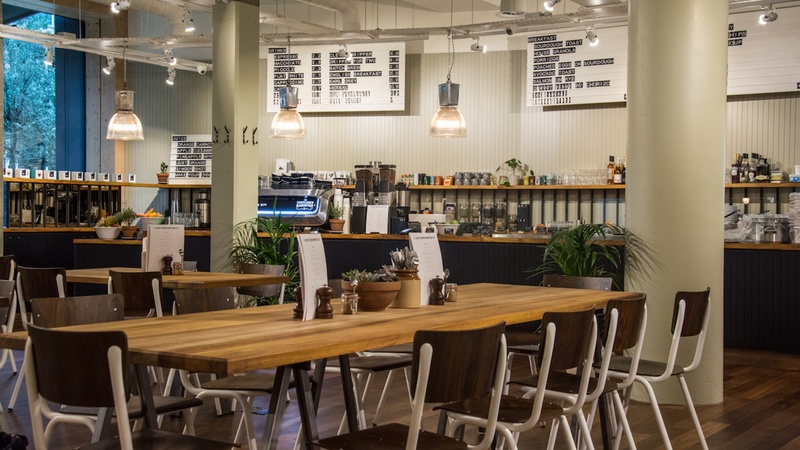 The coffee house serves an all-day menu centred around fresh, seasonal produce, with brunch dishes and lunch spreads complemented by The Gentlemen Baristas’ house-roasted coffee, fresh juices, cocktails, craft beers, spirits and natural wines. To start the day, guests can enjoy an extensive breakfast menu that balances brunch classics, such as Avocado on toast with sumac, dukkah and herbs and Pancakes with bacon and maple syrup, with inventive signature dishes, including Cowboy beans made with smoky house beans, chorizo, peppers, spring onions, sour cream and sourdough toast. The Gentlemen Baristas pride themselves on their suppliers, using Cacklebean’s famous eggs, HG Walter meats and working with Estate Dairy for fresh deliveries of their Guernsey cows milk to accompany their house-roasted coffee. At lunch a range of freshly made sandwiches on sourdough and homemade ciabatta include Truffle mushroom melt with garlic butter, truffle mushrooms, and three cheeses and Smoked ham hock with hock dripping, wholegrain mustard, house pickles and mature cheddar. A large range of salads are also served, featuring the likes of Broccoli with pea, feta, red chilli, poppy seed and rocket and the Kohl-Slaw, with kohlrabi, carrot, red cabbage and parsley. An extensive drinks menu includes wines from Les Caves, a changing selection of bottled craft beers and Fourpure on tap, as well as a short cocktail menu featuring Negronis, Bloody Marys, Red Snappers and Espresso Martinis. Developed as a community hub within the new Republic development, which is home to over 650,000 sq ft of next generation companies and startups, the new site will also play host to a diverse events schedule aimed at bringing people together, including supper clubs, cupping sessions, cocktail masterclasses and more. The Gentlemen Baristas are also working with Tap London, encouraging their community to tap on designated donation points to donate £3 to charities that seek to aid the homeless community. The Gentlemen Baristas opened at the Import Building, Republic, 2 Clove Crescent, London E14 2BE on 20th November 2018. For more information please contact Yasmin on yasmin@toniccomms.co.uk.